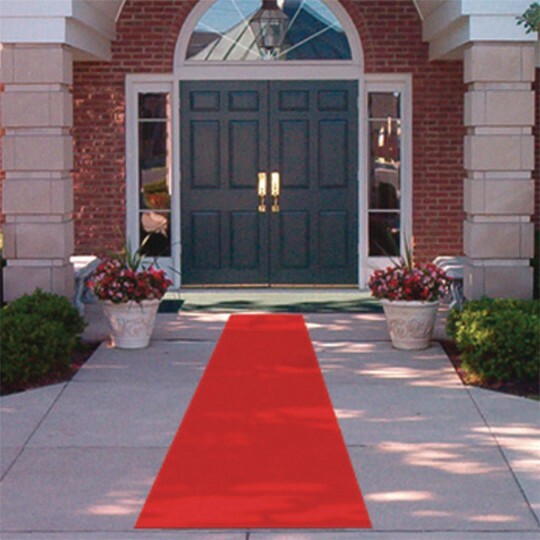 Welcome your star guests in style! 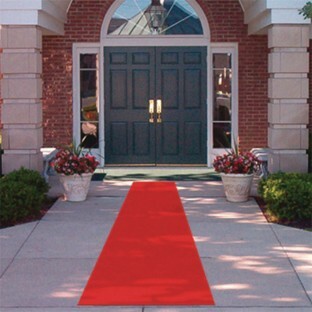 Lay down the red carpet for your star guests! Our New Year party for the senior residents at the Nursing Home were amazed with looks of class of that room after we put down that red carpet. This product was used for Carnival/Casino Night. It had many uses. I used it to cover tables line shelves floors that teddy bears laid on and to cover a bar. The material was durable and doesn't tear easily. Comes with stips you can stick down so the carpet won't move. Can eaily be cut to the size you need. I purchased two of them and have enought left over for next year's Carnival/Casino Night. We used two runners indoors for our planetarium show premiere. The fabric is similar to that used for weddings. The red was bright and fun and the children felt like stars when they posed for pictures. We left the runners stuck to our industrial carpet overnight. It was difficult to get some of the glue off the carpet the nest day. Next time I'll use my own Velcro. I bought two because I saw the length online. I wish they were longer because our lobby is about 25 feet.